How do artists create the illusion of depth on a flat surface? Value is . . .
​The lightness or darkness of an object is called value. Values range from white to black with a number of shades of grey in between. Each object you draw has its own value that can be replicated in a drawing. Values can apply to both black and white and color art forms. Value is one of the Elements of Art. Shading is . . . The lines or other marks used to fill in outlines of a sketch, engraving, or painting to represent gradations of color or darkness. A small variation, gradation, or difference. What is your shading style? 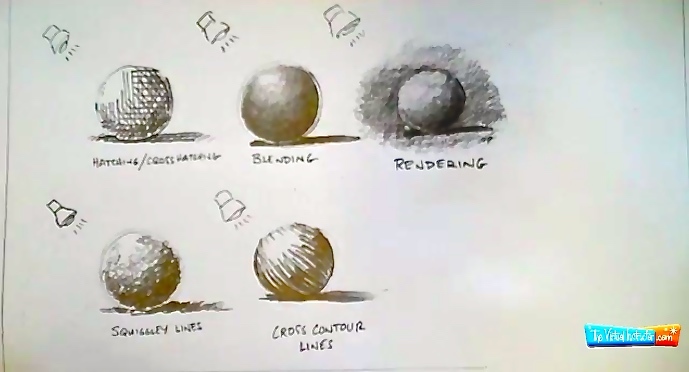 As we begin learning to shade, it is important to understand what your personal technique style is. There is a wide range of styles that range from very tight (clean, smooth, neat and precise) to loose (controlled chaos, movement.and line work) and everywhere in between. No matter what your style, showing strong values is key to successful artworks. Please write the word and definition in your sketchbook. 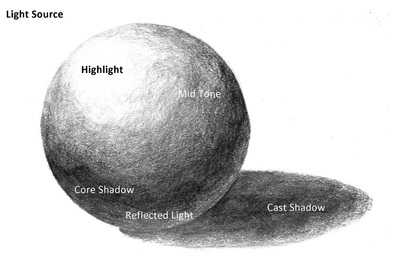 Shading - Using drawing tools to create variation of the light falling on a surface. Gradation - The gradual, often subtle change from light to dark, rough to smooth, or from one hue to another. Tone - The many value gradations in the value scale between white and black. Shadow - The darker value on the surface of an object that gives the illusion that a portion of it is turned away from or obscured by the source of light. Cast Shadow - The dark area that occurs on a surface as a result of something being placed between that surface and a light source. Hatching - Using a series of closely spaced parallel lines to suggest value (Light and Shadow). Cross-Hatching - A series of lines that run in different directions and cross over one another producing a modeling effect without tonal gradation. Chiaroscuro - Modeling, the gradual blending of light to dark to create a three-dimensional illusion. Light Source - The natural or artificial light that is shining on the objects being drawn. There may be more than one light source. Click on the button below and watch the video. Write and Answer the following questions in your sketchbook about the video. What 3 things will influence how smooth your shading is? What kind of pencil motion do you use to create a smooth texture? Shade an example in your sketchbook. 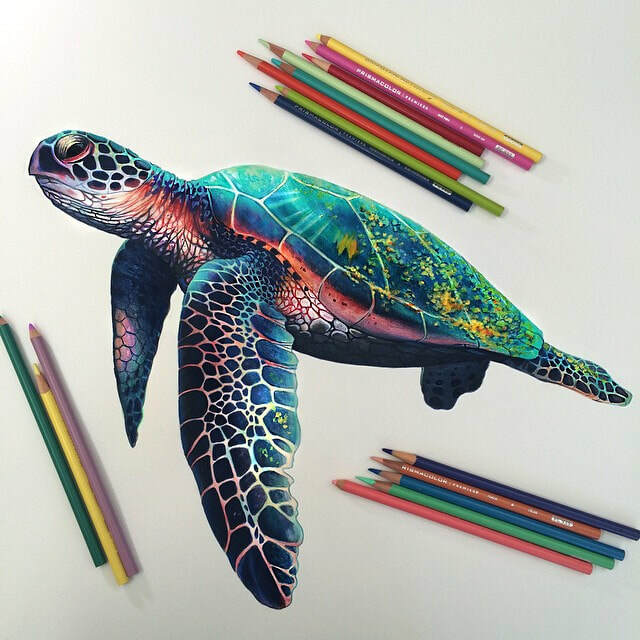 Below is an example of a graphite, paint and colored pencil value scale. In your sketchbook, draw 3 long thin rectangles (approximately 9" x 1") Divide each rectangle into 1"sections. Label each box 1 to 9. The number 1 box should be left white. Starting with box 2, begin lightly shading or painting in the boxes using smooth shading. Each box should gradually get darker as it heads toward the number 9 box. The number 9 box should be as black or dark as your pencil or paint can get it. For the painted scale, add white to the lighter colors and black to the darker colors. The actual paint color should be in box 6. The last block should be almost all black with just a hint of the color chosen for the scale. Always add the darker color into the lighter color. You should add very little at a time since the darker color quickly over takes the lighter color. You will need to mix only a small amount of paint for each box. For the colored pencil scale, use a white colored pencil and a black colored pencil to your main color. Choose a fully saturated color rather than one that is a tint (light version like pink) or shade (a darker version like Navy). Also avoid using yellow or brown. Please create three 9 step value scale in your sketchbook using pencil, paint and colored pencil. Go lighter than you think it should be. It doesn't take too much of a change to move to the next value and it is easy to jump to quickly to atone that is too dark. It is better to have to darken an area rather than erasing out an area that is too dark. Stay inside your box lines, shade each box separately, and use the smooth shading technique. Click on the link below and watch the video. In your sketch, try each of the techniques illustrated in the video. Your circles should be about 1" to 1 1/2".